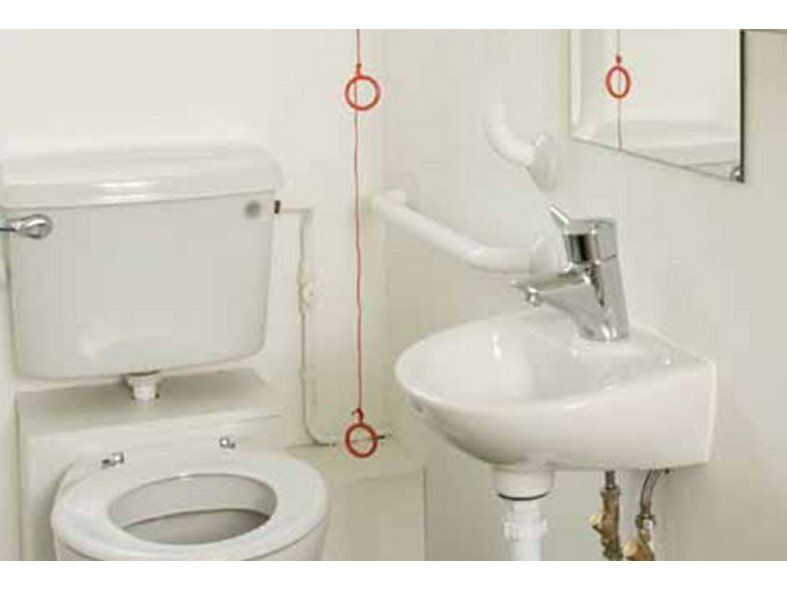 The Wandsworth Disabled Person’s Call System, for use in toilets and bathrooms fully complies with the guidelines outlined in BS8300:2009 + A1:2010 it quickly enables location of any person who is in difficulty. The simple to install system is available as a complete 'boxed' kit for ease of specification and ordering. Alternatively components can be ordered to suit a customer specification or large system requirement. Plates are finished in stainless steel as standard. Multiple Toilet call points can be connected to a multi display panel located in a centrally staffed area. Remote Indicator Panels - Remote indicator panels for multiple disabled person's call systems. These panels would normally be located in a centrally staffed area (e.g. reception or security office) of the building and all toilet/bathroom calls would be routed back for indication of alarm calls. There are four standard indicator panels, each with 1.1 Watt amber indicator lamps, one mini bleep tone buzzer and rocker switch for muting buzzer. QD340 - 3 indicator lamps front cover plate measuring 172mm square. QD341 - 6 indicator lamps front cover plate measuring 172mm square. QD343 - 18 indicator lamps front cover plate measuring 248mm square. Ceiling Pull - A white surface mounted ceiling pull unit, with a 3 meter amber cord. The unit contains an integral reassurance light 2.5 watt with amber lens. Unit is supplied with 2 amber ring pull units (QD351) or 1 amber acorn pull unit (QD322). Unit fits BS31 box with 50.38mm centres. 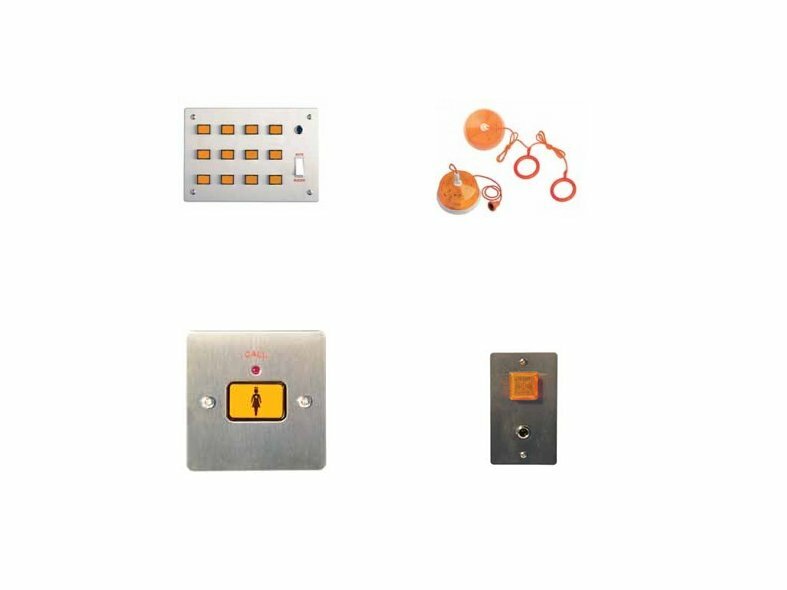 Call Unit - An extra/alternative unit to the QD322/ QD351, the unit consists of a front cover plate measuring 86mm square and containing an orange call button marked with a nurse call symbol. An extra/alternative unit to the QD322/ QD351, the unit consists of a front cover plate measuring 86mm square and containing an orange call button marked with a nurse call symbol. There is a red LED reassurance light above the button. Box flush: 1702/G Box - Box surface: 1132/W. Reset Unit - Used in conjunction with a call unit (QD321) or ceiling pull (QD322/QD351). The QD324 unit is also supplied as part of the QD350 complete system. Front cover plate measuring 146mm x 86mm containing: Reset push with integral reassurance light 1.1 watt with amber lens. PCB components wired to terminal block. Box flush: 1703/G Box - Box surface: 1133/W. Overdoor Lamp/ Tone Generator - Providing both an audible and visual call signal, the QD322 unit is also supplied as part of the QD350 complete system. The front cover plate measures 146mm x 86mm and contains: One 2.8watt MES lamp. (Lenses QD337, are to be ordered separately; see below for details). One mini bleeptone generator. Component wired to terminal block. Box flush: 8302/G - Box surface: 8387/W. Power Unit - QD153 - Input 230V 50 Hz, an earth connection is required. Rated output 1A 24Vdc. Output fuse 1A quickblow 20mm x 5mm. Size: L 200mm x W 100mm x H 100mm Power Unit Weight: 1.5 KG.